Of the nearly 1.5 million people living in Suffolk County, New York, nearly 13 percent speak Spanish. So what do you do if you’re the police chief in a community like this one? 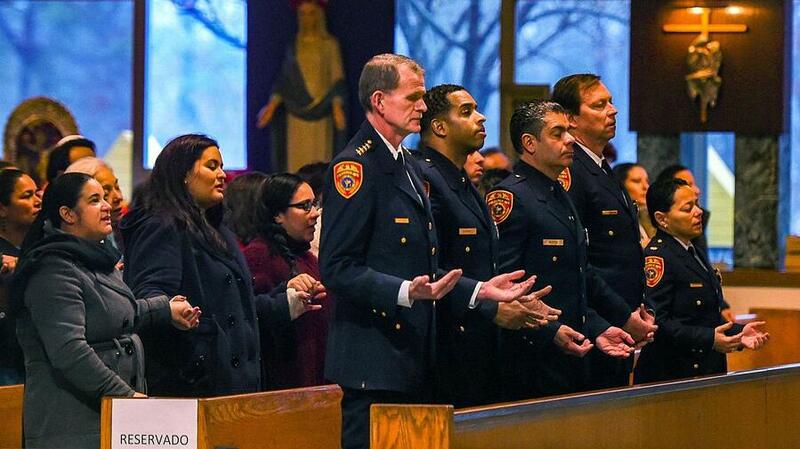 If you’re Suffolk Police Chief of Department Stuart Cameron, you learn Spanish. He flexed his newly acquired skills on a recent Sunday morning when he addressed hundreds from the pulpit during Mass at St. Anne’s Roman Catholic Church in Brentwood. Cameron’s newly acquired skills are part of an ongoing effort to improve relations between the police department and the Latino community. "I know some people are afraid of the police in Suffolk County—that really breaks my heart," said Cameron, a 34-year department veteran. "Our department truly is here to help people. So I want to try and personally get that message out by giving it myself and taking time to learn Spanish." “‘Yo soy su jefe,’ which means ‘I am your chief,’" Cameron told the congregation during the Spanish-language Mass, and later joked about "mi mal español"—his “bad Spanish”—which drew applause and laughter from the parishioners. It was one step in what has been a major department effort to ensure non-English speakers can access police services. Another important component of the department’s language access plan is giving officers tablets equipped with LanguageLine InSight®, a mobile application that delivers one-touch, real-time interpretation in more than 240 languages. Video interpretation is available in 36 languages through the InSight® application, including American Sign Language. Suffolk is one of numerous police departments around the country deploying LanguageLine InSight® in an effort to improve community relations by giving officers instant language access in the field. "People just need to be affirmed that police are friendly to us, they are here to help us," Rev. Stanislaw Wadowski, a pastor at St. Anne’s who speaks fluent Spanish, told Newsday. "I'm grateful for that presence and giving us a sense of security."